Emptiness is at the heart of the great perennial traditions. Sufi rituals are a journey from form to the formless. In Buddhism the Heart Sutra describes how: 'So in emptiness there is no form/ no sensation, conception/ discrimination, awareness. Alexander Benzin explains the Buddhist concept of voidness as a total absence of the strange, impossible, ways of existence that we fantasize and project onto our experiences. While Lama Yeshe described the Tibetan Buddhist practice of Tantra as dissolving our ordinary perceptions of ourselves and creating an empty space for the essential clarity of our deepest being. Unlike its Western counterpart, Eastern art music relies on improvisation - using voidness to bridge form and the formless. The Savall family has a long tradition of uniting East and West, and Impro, Ferran Savall's second solo album, documents the evolution of his unique style of improvisation over the last decade. 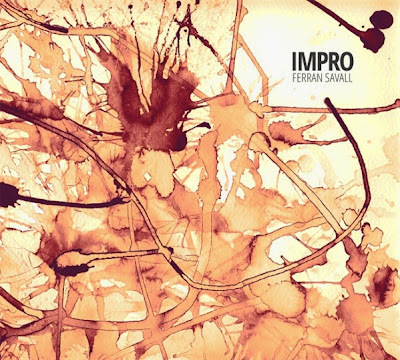 For the thirteen untitled improvisations Ferran accompanies his largely wordless vocals on guitar, theorbo and vihuela, and on some tracks he is joined by percussionist Pedro Estevan and father Jordi on viol. There is an enigmatic bonus track in the form an idiosyncratic rendition of Harold Arlen's Somewhere Over the Rainbow, and, equally enigmatically, the notes include a thank you to Ferran's late mother Montserrat Figuras for "teaching me to walk without fear". Today, commercial imperatives dictate that art must reinforce our conceptions, projections, and discrimination. But Impro, which is released by Alia Vox, exhibits an essential formlessness which means it does not fit into any of the strange, impossible categories that we project onto art music. So, almost inevitably, commercial voidness will follow. There is more on Ferran Savall in Early music unplugged. No review samples used in this post. Any copyrighted material on these pages is included as "fair use", for the purpose of study, review or critical analysis only, and will be removed at the request of copyright owner(s). Also on Facebook and Twitter.